By 1855, many thousands of Mormon Pioneers had already braved the difficult trek west to join the main body of the Mormon Church in Utah. Many thousands of others also wanted to, but could not afford the expensive wagons and oxen. To assist these, the Mormon Church, using money from the Perpetual Emigration Fund, established handcart companies, each of which would be accompanied by a small group of wagons with oxen to carry heavier items. These saints traveled from Liverpool by boat to New York then took the train to its most western point, Iowa City. From Iowa City, the saints walked and pulled handcarts 1,300 miles. 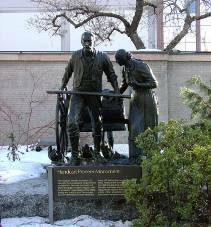 A Monument dedicated to the Mormon handcart pioneers on Temple Square c2002 Brigham Young University. All rights reserved. 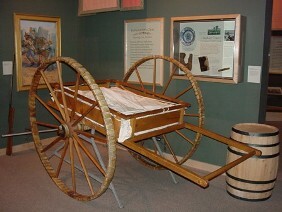 The first two handcart companies successfully arrived in Salt Lake City on September 26, 1856. These two companies included 486 Mormon pioneers using 96 handcarts. They made the journey in sixteen weeks. A third company arrived on October 2, with 320 people. However, two companies left late and used green wood to make their wheels, which consequently broke down frequently. This and bad weather further delayed the already late pioneers. These two companies are the well-known Martin and Willie Handcart companies. A group of missionaries following the trail, led by Franklin D. Richards, passed the two handcart companies. The missionary group arrived in Salt Lake on October 4, and Elder Richards reported the large number of people still on the trail so late in the season. Many were shocked, especially because they knew that the handcart companies had little extra supplies. Because it was so late in the season, the members in Utah had stopped sending resupply wagons out onto the trail, because they thought that no more companies would be coming. President Brigham Young immediately began organizing a rescue effort. At a General Conference of the Church held on October 5, he urged men and women to make rescuing these companies their top priority. If not, he said, "your faith, religion, and profession of religion, will never save one soul of you in the celestial kingdom of our God, unless you carry out just such principles as I am now teaching you. Go and bring in those people now on the Plains, and attend strictly to those things which we call temporal, or temporal duties, otherwise your faith will be in vain; the preaching you have heard will be in vain to you, and you will sink to hell, unless you attend to the things we tell you" (Journal of Discourses 4:112). Twenty-seven men left on October 7, with sixteen wagons of supplies. Eventually, 200 wagons of supplies were gathered and sent. Unfortunately, the weather which hindered the handcart companies also hindered rescue efforts. Two weeks after the Utah Saints learned of the late-coming companies, one of the earliest blizzards on record began dropping snow on the Rocky Mountains in central Wyoming, where the ill-supplied handcart companies had just arrived. The extreme conditions began to cause deaths. Luckily, the first rescue party found the Willie Company on October 21, just one day after the company had run out of food. The rescue team provided food and rest from the storm, but the company still had to struggle over the treacherous passes in the Rocky Mountains. The Willie Company arrived in Salt Lake on November 9. They suffered the loss of 68 members of their company, and many suffered from severe frostbite. The Martin Company suffered worse losses. Three-fourths of this company were women, children, or the elderly. They made camp in a place now known as Martin's Cove in central Wyoming. When the storm hit on October 19, they waited nine days with reduced rations for it to end. After finding the Willie Company, many of the men of the rescue party were sent on ahead to search for the Martin company. They found them east of South Pass, suffering greatly in Martin's Cove. The supplies that were available were not enough for the desperate company. They struggled 55 miles more on the trail, then camped again near Devil’s Gate. However, the storm was making it difficult to get supplies to the company. After five days of waiting and losing many more of their company, they broke camp again and continued on the trail. Just as the Martin Company was about to make the climb over South Pass, thirty wagons of supplies arrived. Once they had food, they were able to make the rest of the trip quickly, and they arrived in Salt Lake on November 30. Of the 576 members of the company, 145 died on the trek, and many others suffered from frostbite. The decision to allow the handcart companies to leave so late was reckless, and President Brigham Young severely reproved those who had allowed it. This however, did not stop the use of handcart companies, since companies which left early in the season faced no problems. In the following years, six more handcart companies successfully made the trip from Iowa City to Salt Lake City. In all, more than 2,962 people walked to Salt Lake City with handcart companies. Of these, 250 died on the trail. Only 30 of these deaths were not of the Willie and Martin companies. Some years after the Martin company made their journey to Salt Lake City, a teacher in a Church class commented how foolish it was for the Martin company to come across the plains when it did. The teacher criticized the Church leaders for allowing a company to make such a journey without more supplies and protection. I was an old man sitting in the classroom listening, then I spoke out, asking that the criticism be stopped, ‘Mistake to send the Handcart Company out so late in the season? Yes. But I was in that company and my wife was in it. … We suffered beyond anything you can imagine and many died of exposure and starvation, but did you ever hear a survivor of that company utter a word of criticism? Not one of that company ever apostatized or left the Church, because everyone of us came through with the absolute knowledge that God lives, for we became acquainted with Him in our extremities. ‘I have pulled my handcart when I was so weak and weary from illness and lack of food that I could hardly put one foot ahead of the other. I have looked ahead and seen a patch of sand or a hill slope and I have said, I can go only that far and there I must give up, for I cannot pull the load through it. … I have gone on to that sand and when I reached it, the cart began pushing me. I have looked back many times to see who was pushing my cart, but my eyes saw no one. I knew then that the angels of God were there. Relief Society Magazine, Jan. 1948, p. 8. This page was last edited on 18 October 2011, at 09:39.